I think what would surprise people the most about photography is just how much time is spent on photography that doesn't actually involve taking pictures. I recently attempted to put together some estimates for the total time involved so I could come up with pricing. What I came up with is that after it's all said and done, I estimate for every one hour of shooting time, it takes 3 - 4 hours of processing and handling time. What the heck takes so long? Don't misunderstand. I love it, and its super fun, but there's definitely more than meets the eye... especially when it comes to Photoshop. 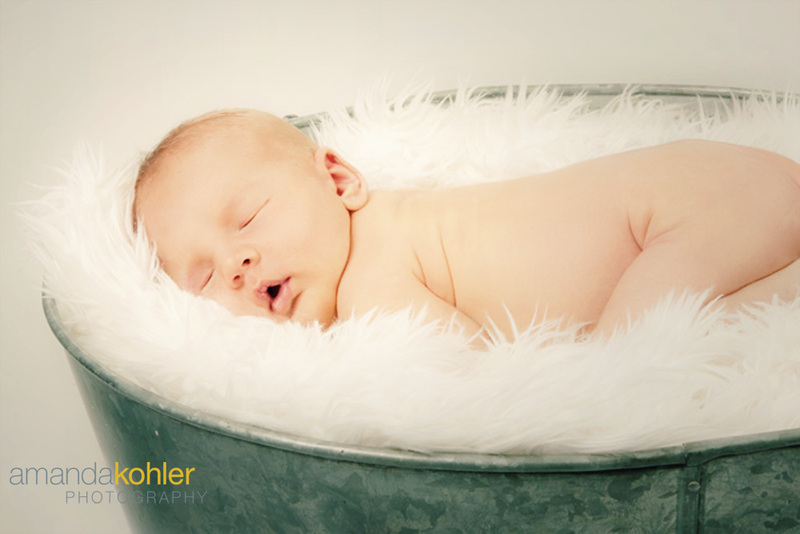 Check out this cute little guy I took newborn pictures of last year. By the way, how freakin adorable is he? I get to take his 1 year pictures in a few weeks! In this picture I definitely could have saved myself some trouble by realizing pieces of blanket were blocking his little face, and cleaning the spot off my camera sensor... but still. What do you guys think? Notice that big of a difference between the first picture and the second? Would you spend 5 minutes in Photoshop to create the top picture? For example, I liked the bucket with a blue color-cast, but maybe other peple don't like it or don't care? What about some selective lightning and darkening (burning and dodging) to make the photo look a little more three-dimensional? Can you guys tell the difference?